Back in glamorous shiny Singapore. High hopes for this weekend as the two previous races were the worst suited for the Lotus car so far. And yet Kimi managed to bag a podium and a 5th place in Spa and Monza. 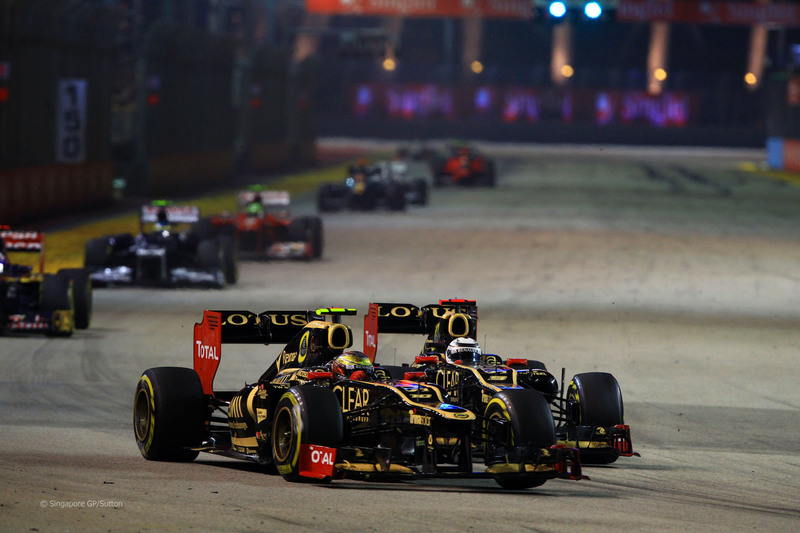 So since the Lotus team had predicted that Singapore should be better, then a return to the podium could be possible? It quickly came down to earth after qualifying though. In fact already after the free practice runs where the pace was up to 2 seconds off the leaders at times.. Looked a little better in FP3 and Q1. But then Kimi got out into traffic on his final run in Q2 and could not capitalize on the super softs. And his second lap, he seemed to make a mistake in sector 2. But he revealed later that, no mistake – he just didnt have the grip. Result: 12th on the grid. In fact he had complained of the unpredictability of the car to the team. That it suddenly “went better on the used tires” and that “we dont understand the car”. So some points would be the best to hope for it seemed. Lights out and everyone gets away relatively clean. 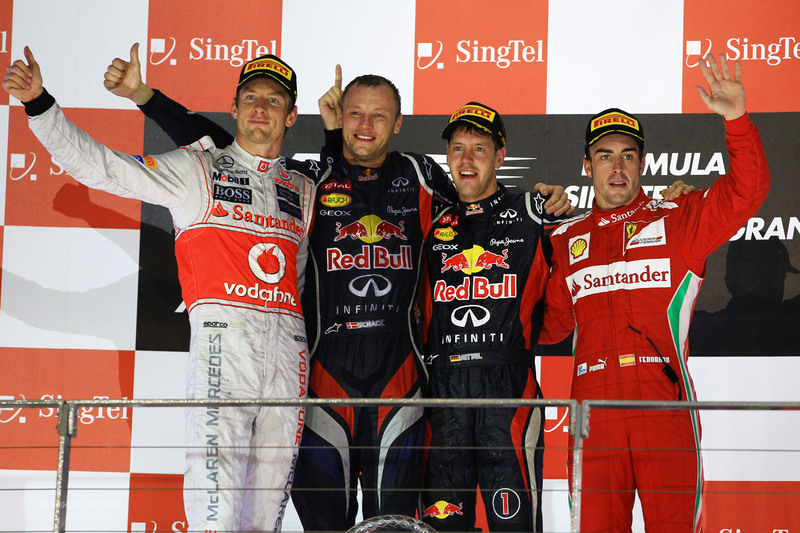 Vettel makes up a place from Maldonado and slots in 2nd behind the polesitter Hamilton. So does Button who is 3rd, Maldonado 4th and Alonso 5th. 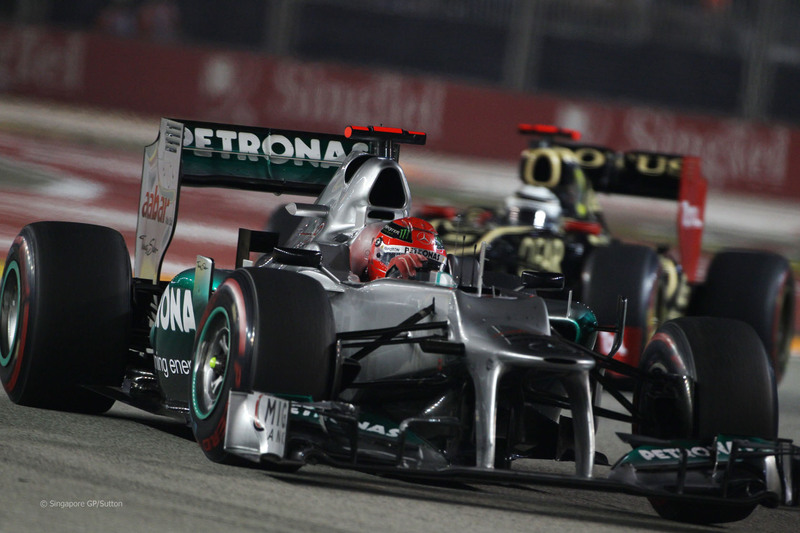 Kimi gets past Hulkenberg on the first lap and is now finding himself behind Schumacher yet again. A recurring thing for the past 3 races. Lap 22, raceleader Hamilton retires with gearbox failure. A nice gift basket for Alonso. One gets flashbacks from Kimis time in McLaren watching this. It was an open goal for Hamilton that would have really closed the McLaren driver up to Alonso in the standings. Well, to be honest we can skip to lap 33 from there, because nothing much happened up til then. 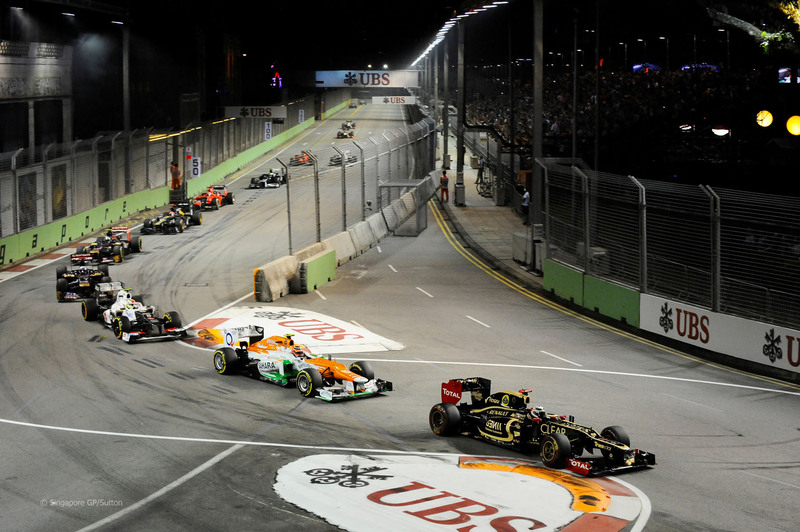 The Singapore surroundings are spectacular, but the track itself could do with some improvement. Overtaking is near impossible. Last year were much better in that department, but no one really gets by anyone unless the person in front are struggling for grip. So Kimi is behind Schumacher in the Mercedes for what roughly feels like 18 months. Pit stops happen – there is a shuffle and when the dust settles, Kimi is still looking into the gearbox of the same silver car. Anyway – on lap 30 the Indian guy of the field has had enough and slams his HRT into the wall by the tunnel. 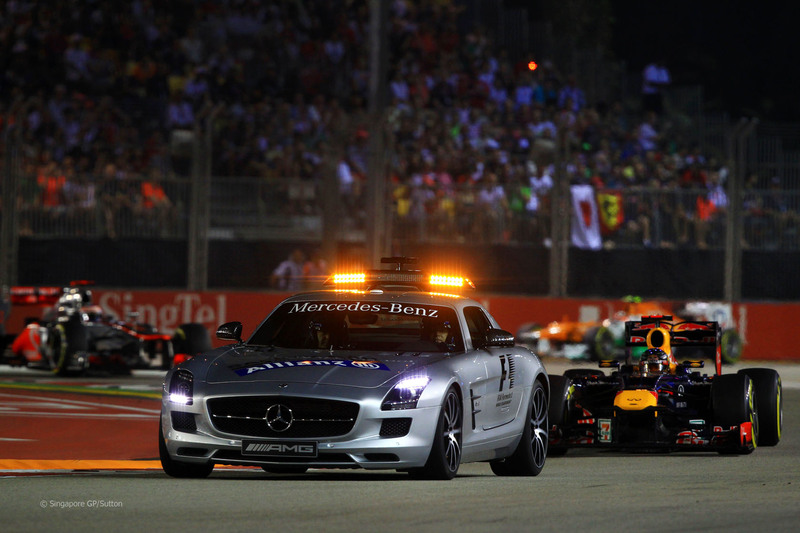 Send out the Mercedes SLS and lets close up the field. We see some onboard from Button warming his tires behind Vettel waiting for the restart. A dap on the throttle from Button and a hard braking move from Vettel sees them coming just inches from taking each other out. First I was like, “WHOA!” and then I was like, “Dude, that was frickin’ close!” Alonsos backstage voodoo dolls nearly gave him another gift basket. Then something weird happens after the restart. Allow me to copy and paste a segment of my review from last years Singapore race: “I yell “Nooooooo!” at the screen as I watch the Mercedes of one Michael Schumacher take flight over the Sauber of Perez.” That was 2011. 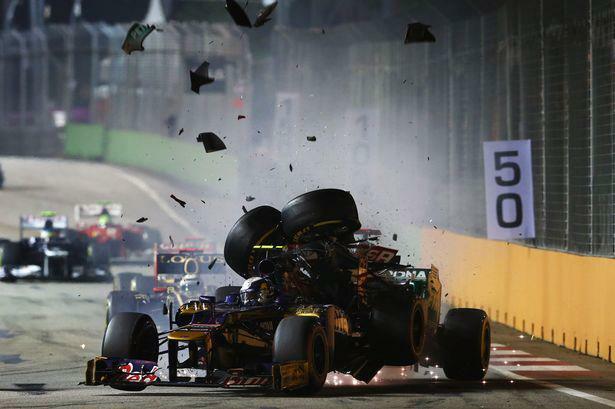 In 2012, Jean-Eric Vergne is this years recipient of being rearended by Schumacher as we see a replay of last year. Or close to it. It wasnt pretty and it ended both their races then and there. 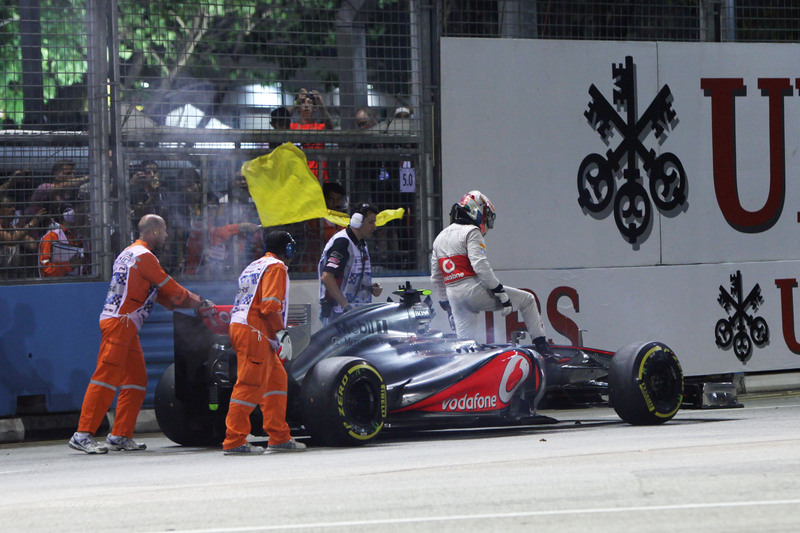 Post-race, Schumi was handed a 10-place grid penalty for failing to anticipate lower braking performance after safety car. Well, one mans fail is another mans gain as they say. And the Iceman moves up two places and gets a change of scenery from watching the back of the Merc. As the Safety Car comes out again, Perez, Hulkenberg and Webber pits, moving Kimi up to 7th and he has now caught up with his teammate. Kimi takes up the hunt on another Mercedes but decides to save the engine for Suzuka and claim 6th place behind Rosberg. A position that many of you guessed he would claim this weekend. Once again though, he benefits from others misfortune. The best thing the E20 has going for it at the moment is its reliability, because it is darn well not quick enough. It certainly does not belong in the top 3 like this. And there is only Kimis speed and uncanny talent to stay out of trouble and rank in the points to thank for it. Congrats to Sebastian Vettel for winning the race. Incredibly, he hasnt won a race since Bahrain. Is he now the main contender, or can Hamilton still do it? McLaren still looks like the fastest car in his hands overall. We have the Suzuka race coming up in 2 weeks. That mythical DDRS better make an entrance and an impact there. Because there are 7 other cars out there that are faster than him at the moment. Yes, I am counting the Mercs as well. They certainly qualify ahead of him which is hurting too much in the races when he has to make it past them. And only 7, cause I am not counting Massa. Sorry. And I am only half counting Webber as well because he is not impressing anyone at the moment. Anyway – 6-7 cars with full potential to finish ahead of him in races. You dont win championships like that. I guess this is where push comes to shove. This might be where who has the best resources really shines through. Mercedes, Ferrari, Red Bull and McLaren certainly have the means they need to make their car quicker. Red Bull was very strong today. Vettel looked like he could have won even without Lewis retiring. Who knows. But the point is, they are back in the game. Lotus is not. I predict that the race in Japan will be a make it or break it for Lotus and the E20. Their updates and the DDRS has to come together perfectly to get them back in position to fight with the front runners like before. There are updates coming so lets hope they work better than the ones after the summer break. Im gonna sign off here folks. Less than 2 weeks to go for Suzuka. Stay frosty now, y’hear. Quick race rating – 5 out of 10. Race livened up a bit after the safety cars. Otherwise a bit dull. Peace! This entry was posted in Formula 1 and tagged 2012, Alonso, Button, Eau Rouge, F1, Ferrari, Formula 1 Singapore, Hamilton, Ice cream incident, Iceman, Kimi, Kimi passes Grosjean, kimi raikkonen, Lotus E20, lotus team, Lotus team order, McLaren, mclaren driver, michael schumacher, Podium, qualifying, Romain Grosjean, Santander, Schumacher, Schumacher Vergne crash, Singapore F1, Singapore night race, Vettel. Bookmark the permalink. Hopefully the Lotus and the upgrades will keep it up otherwise it’s sayonara to the title hopes. And I don’t want it! I still believe in miracles, a Kimi fan should believe after seeing 2007… right? I was so disappointed they didn’t run DDRS O__O Seriously? They really have nothing to lose. Are they planning to run it next season when FIA might ban DDRS? Come on Lotus! I have to say, Kimi retained 3rd mainly because the others contender are out or he would hae lost the 3rd place. Mclaren will be faster until the end of the season and the only team can challenge them perhaps RBR .. I am not rally counting Ferrari out but their pace really not that impressive (honestly speaking ) Massa wouldn’t be in top 10 if Maldonado and Hammy boy were not DNS. 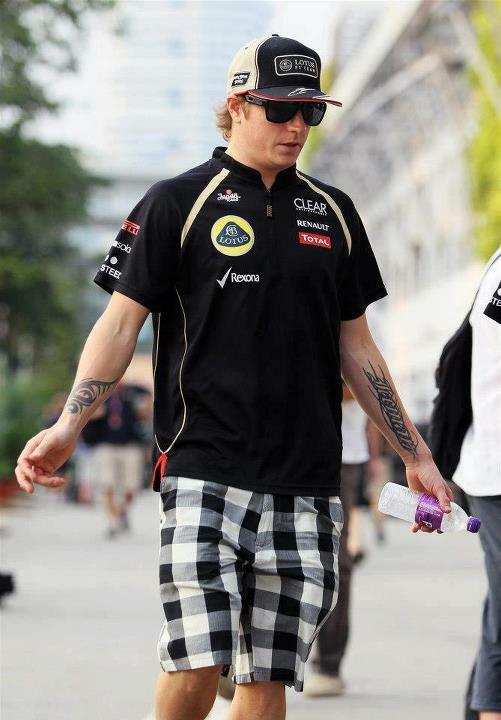 I have to be the most not optimistic one here haha I have to counting Kimi out now.. Lotus in Japan worrying ….